I enjoy public transportation but sometimes (most of the time) it’s really inconvenient. I don’t have time to always be on someone else’s schedule! 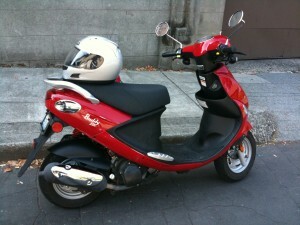 So now I ride a 2008 Genuine Buddy 125cc scooter. Isn’t she gorgeous? I filled the gas tank the other day and it cost me $1.50. Be careful, though. Lots of bad drivers out there. For example, I was biking home one evening and nearly got run over by an idiot who ran a red light. I will request a ride on it next time I’m in Seattle . That is quite a fine ride! Nice colors, nice lines. Spiffy! Even though I ride a ‘real’ motorcycle (whatever that means), I love scooters. They just aren’t practical where I live out in the country. If I lived in the city, I would SO have a pink Vespa! (Be careful though – many scooter riders tend to feel safer than they should – you should still wear proper gear, like jeans and sturdy shoes!